Zuma game is a fascinating brain game, which makes the game more of a challenge in challenging times. 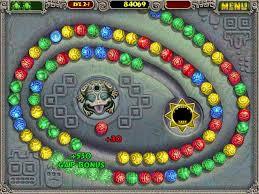 Your mission is to play the ball game in the classic zuma game that controls the frog to blast the balls. Zuma is being released for free on iOS and Android . You can play online here. Shoot balls by clicking on screen where you want the ball to go. Clear balls by getting three or more of the same color in a row. Beat a level by filling the zuma bar and then clearing out any balls the remain. Don’t let the advancing balls reach the skull or you’ll lose a frog.